While my family was in California visiting Disneyland we were told that Disney’s California Adventure featured a must-see show. World of Color was described as enthralling nighttime spectacular weaving water, color, fire and light into a kaleidoscope of fantasy and imagination. Sounds fascinating, doesn’t it? You have no idea… unless you’ve seen it. We were mesmerized. Once I got back to our hotel room that night I posted my initial reaction on Facebook. 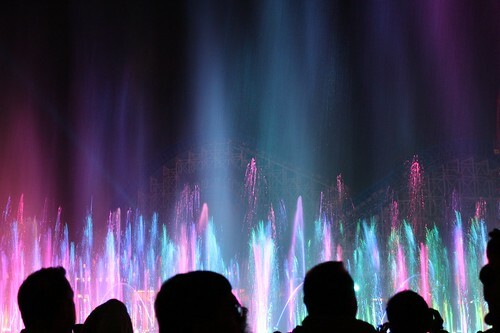 Tonight’s World of Color show spectacular at Disney’s California Adventure was absolutely stunning. I’ve seen light shows, I’ve seen water shows, I’ve even seen fire shows but wow… this show was breathtaking. Words can not even describe it. The kids were amazed. 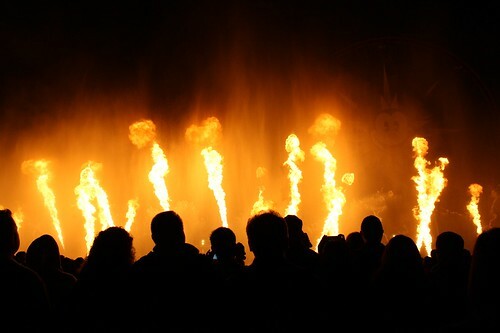 Mix in a huge water show to Disney classics, music, a beautiful light show and toss in some fire. Highly recommend. When I say that words cannot do this show justice, I mean it. I’ve been to Las Vegas and watched the water show at the Bellagio. I’ve been to Riviera Maya where our resort hosted the most amazing fire show I’ve ever seen. Therefore I thought I knew what to expect from World of Color. 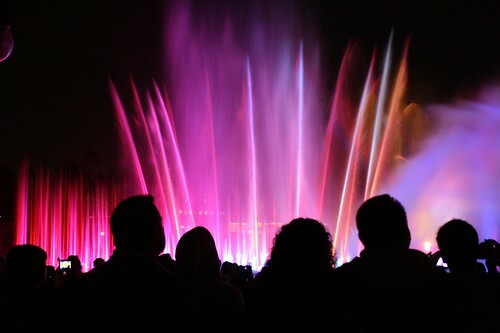 I expected to see a beautiful water show with lights while Disney broadcasted the theme songs to their movies. I did not expect the magnificence displayed at Disney’s California Adventure. The water shot up in the air so high that several rows of people felt a mist. The water danced along to the songs from our beloved Disney movies while vibrant colors in multiple hues danced in the sky. Just when I thought the show could not get any better scenes from some of our favorite movies were displayed right on the water sprayed from the fountains into the air. We actually saw clips from movies in the sky against water! It was difficult to capture the movie scenes on my camera from where I stood but I will say that the images were crystal clear. Throughout the whole show there was a lot of ‘oh look, ahh wow, that’s amazing, did you see that? !‘ being said in the crowd. It was simply stunning. Did I mention fire? Yes, they even added the element of fire to the show. I highly recommend the Fastpass option available. Disney FASTPASS tickets are available on a first-come, first-served basis for same day World of Color showtimes. Tickets are distributed at the Disney FASTPASS Service machines used for Grizzly River Run. 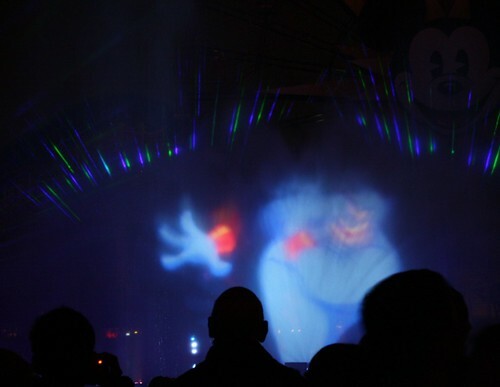 Learn more about how to use Disney FASTPASS Service with World of Color. I suggest as soon as you arrive at Disney’s California Adventure, first thing in the morning, you head over to get your Fastpass for World of Color. These go quick and you want the best seats available. Another option for viewing World of Color with reserved seats is going with one of the dining options. We did this and hated it. Just being honest. The prices were extremely high – $41.99 adults & $21.99 children ages 3 to 9 – and the food was mediocre at best. Our family did not eat half of it and as you can see from my photos our seats still weren’t that great. I had to hold my 6 year old in my arms to see the show. Our reservations were at 6:30 and we were rushing to the show at 7:50. It was not a fast nor smooth experience and the crowd was huge. We still got within the reserved section for our restaurant but there were still rows and rows of people in front of us therefore I had an obstruct view which is why people’s heads are in my photos. I chalked it up to an over $200 lesson learned and since the show was so wonderful we were not disappointed in it. However next time I will go the Fastpass route. Have you seen Disney’s World of Color spectacular? You can view all my photos from Disney’s California Adventure on Flickr. OOH and we are SO CLOSE to Anaheim now!! That last shot is awesome! We’ve never been to the California part but it looks great. Wow! That is incredible! I would love to see this sometime. I haven’t seen that yet, but I’m so glad you shared your experience with it. Fastpass it is, for sure! I know it wasn’t the best for viewing, but the people’s heads in your photos add to the effect. They are spectacular! Thanks for the awesome post. We’re headed to Disneyland and CA adventure in a few weeks and I’d never even heard of World of Color. Isn’t it amazing?! Your photos of the show are awesome! Sharing on my DisneyInTheDesert blog! Oh my beautiful! What an experience, love love this! Awesome photos! One day, I will venture out to CA!